Your carpet will be dry in 30 to 90 minutes! No more walking around on soggy carpet for days. A safe Ph balanced cleaner that's non-toxic, biodegradable and safe for children and pets! 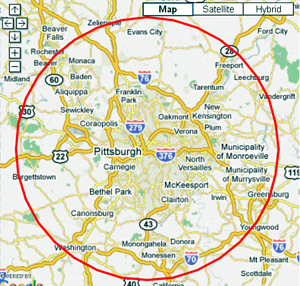 We are conveniently located within the Pittsburgh Metro area to serve you quickly! Watch our video appearance on the television show "Designing Spaces"! Since 2006, Oxymagic of Pittsburgh LLC has been at the leading edge of carpet cleaning technology. We are the newest, safest and best method on the carpet cleaning market today! Oxymagic has been featured in nationwide publications including: Better Homes & Gardens, Budget Decorating magazine, Entrepreneur magazine and on television with Designing Spaces. We pride ourselves on professional technicians, prompt service, fast dry time and safe cleaning. Guaranteed Price Over the Phone! Don't be fooled by other carpet cleaners advertising a low price, only to increase it once they are in your home. Oxymagic offers a Guaranteed Price Over the Phone! The price you are quoted is the price you will pay! 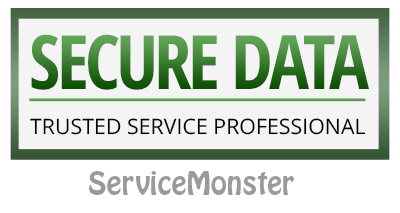 * You will be pleased with our upfront and reasonable pricing-without the gimmicks or hidden fees. What is the Oxymagic method? 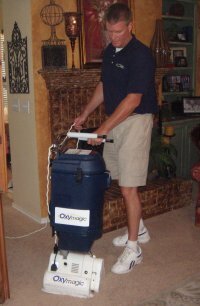 From the moment an Oxymagic technician arrives at your home, you'll know "this cleaning is going to be different!". Our technician will review your work ticket with you & inspect the rooms for cleaning. Any spots/stains will be pre-treated using our advanced cleaners. The Exclusive Oxymagic Safe, Non-toxic, Natures Way cleaner will be applied. Our cleaning machine uses dual cylindrical brushes that go deep down into the carpet pile and lift the dirt out. Our machine also uses powerful suction to remove the dirt and grime. Your carpet will be clean, dry, and ready to use after 30 to 90 minute average dry time. "Biozyme" Odor & Stain treatment for carpet & upholstery. An all natural, enzyme based organic solution for odors & stains. "Carpet Shield" protectant treatment for carpet & upholstery. A water based solution that protects against spills and helps resist stains. The most important thing you can do to ensure the cleanliness of your carpet is to have it professionally cleaned, at least on an annual basis. This will also increase your carpet's useful life. Cleaning frequency of course will vary, based on your home environment (pets, kids, heavy traffic, etc). In any case, the longer you wait, the more it will continue to collect dirt, stains, germs, bacteria, and pet dander. Carpet manufacturers generally recommend annual cleanings as well. Another important step you can take is to vacuum regularly, at least weekly, maybe more if there is heavy foot traffic. This will help minimize the buildup of dirt brought in from the outdoors that inevitably ends up on your carpet. And of course, address spills immediately. For more information or to obtain a no obligation quote, call us at (412) 781-4110. Copyright © 2009 - Oxymagic of Pittsburgh (Oxymagic Franchise Development Corp.) | Marketing by Higher Images, Inc.